At Knole Academy we believe it is essential to measure and report on all our students’ progress at key points in the year. This allows us to monitor the level of their improvement and support them to move forward. Attainment and academic progress are measured using a variety of methods, such as exams and other formal tests, as well as teacher assessments. Mock Grade – For years 13, 12, 11, 10 and 9 only, where appropriate. A current attainment/working grade- this is based on recent assessments and we expect this, in some cases, to be volatile as students do different aspects of the courses. A Work Hard Grade – for KS3 and 4 only- this is the grade the student could achieve if they were to work to the very best of their ability. Parents and students are invited to academic tracking meetings at 3 points in the year. Each student has a specific academic mentor, with whom they will meet throughout their academy career. Before each interview parents and the student receive a copy of the student’s report recording the information as stated above, which they then discuss with the mentor using the ‘Horsforth Quadrant’ (see below). 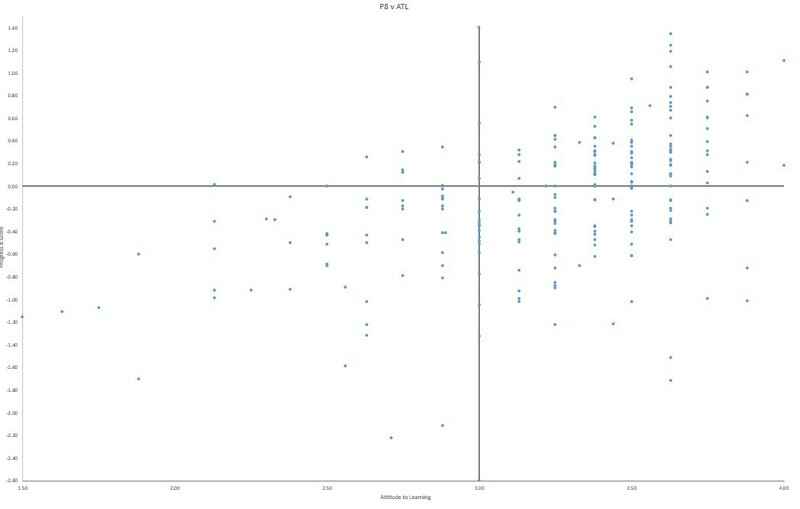 This graph plots attitude to learning against progress scores to view each student’s position in relation to the rest of the year group and their own targets. Depending on which quadrant the student is in the mentor will then support him/her to move forward using bespoke resources. Parents and students are also invited to Parents’ evenings once a year, to discuss the student’s performance with his/her individual subject teachers.